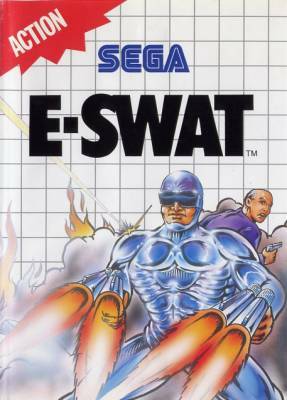 59 CVG magazine "Complete Guide to Sega"
E-SWAT IS: the toughest fighting force alive! 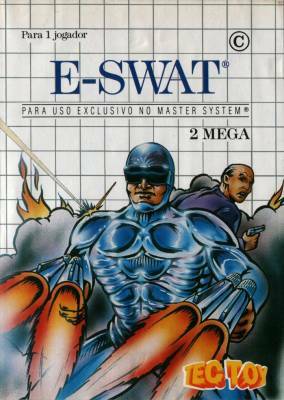 E-SWAT MEANS: Enhanced Special Weapons and Tactics! You're staring straight into the evil E.Y.E., a power-mad horde of vicious terrorists. But you are the ultimate crimebuster. Decimate their front fines with your lead-belching Gatling gun! Incinerate their mobs with your super-charged arsenal of weapons! 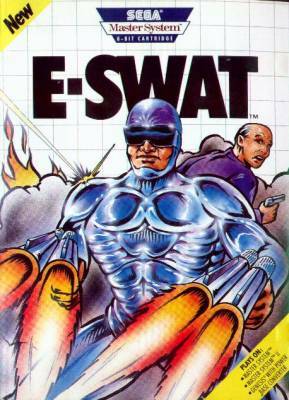 Start as an E-SWAT rookie and blast your way up to become an awesome supercop... More machine than man! Metal attack! 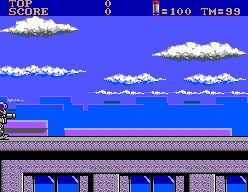 Annihilate killer hovercraft maniac machines and flame-throwing robots. 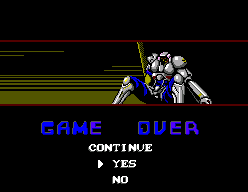 Grapple with bionic monsters to face the final showdown! Stay glued to your weapons through 5 missions of grueling combat! You have the ultra-tech gear and the guts to survive! The E-SWAT force is waiting. Are you ready to "Hit The Streets"? White cardboard box. 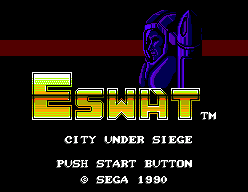 Cartridge label spelling is "E-Swat". 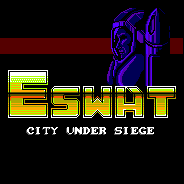 There is a development page for E-SWAT (City Under Siege). Visit it to see technical discussion of this game.